I recently completed a rather large business card data entry project for my lovely new client. She had accumulated approximately 450 (I didn’t count them all…!) business cards through the many networking events she attends and had never done anything with them. My task was to enter them all onto her CRM (Client Relationship Management) system for her so that she could actually follow up and do something with all these useful people she has met. 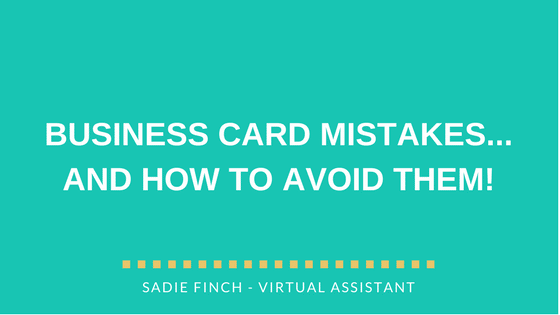 Whilst entering the data, I came across so many mistakes that people had made on their business cards that it’s prompted me to blog about it so that I can make sure YOU never make these same mistakes! Incomplete names – yes really! People using just initials or not adding their first or surname is just not helpful. OK, if your business is called Flowers by Fred, then I have a pretty good idea that your name is Fred, but it doesn’t help me to enter it into a database if I don’t have your surname – which means you can’t be added and I won’t be buying flowers from you. Sorry, Fred! Telephone numbers – it really surprised me just how many cards didn’t have a contact telephone number on. OK, so you may not like speaking on the phone, but the connections you make might prefer to call and if they can’t do that, they’re likely to try elsewhere. If you haven’t added it because you’re not always available to take calls then consider using a call answering service. Oh, and for goodness sake, put some spaces in your phone number or it’s impossible to read! Spelling mistakes – It’s definitely a good idea to have someone else read over your cards before submitting them to the printers – spelling mistakes are never a good look. Spacing – there were either cards that had SO much information crammed onto one side that it was difficult to read, or there were others who didn’t have very much information on the card but it was spread over two sides so I had to keep flicking backwards and forwards. Use the two sides wisely – have your logo and business information on one side, and contact information on the other. What do you do? If your business has an obscure, undescriptive name then include some sort of description on your business card as to what it is you actually do. Some people attend networking events every week – you need to ensure that they remember who you are! There are things worth mentioning like the quality of the card you choose (don’t print it yourself!) and names/numbers being scribbled out/written on. Business cards don’t have to cost a fortune but always remember that your business card is the one thing that someone has to remember you by after an event – leave a good impression! And more importantly, ensure there’s no vital information missing that could lose you business. If you have a pile of business cards sitting on your desk that you keep meaning to deal with, send them my way and I’ll get them all ship shape for you in no time! Contact me at sadie@sadiefinch.com to arrange this or any other tasks you may wish to outsource.